Join us in honoring the important occasion of Jagadguruttam Mahaprayan Diwas – the ascension day of Jagadguru Shree Kripalu Ji Maharaj. 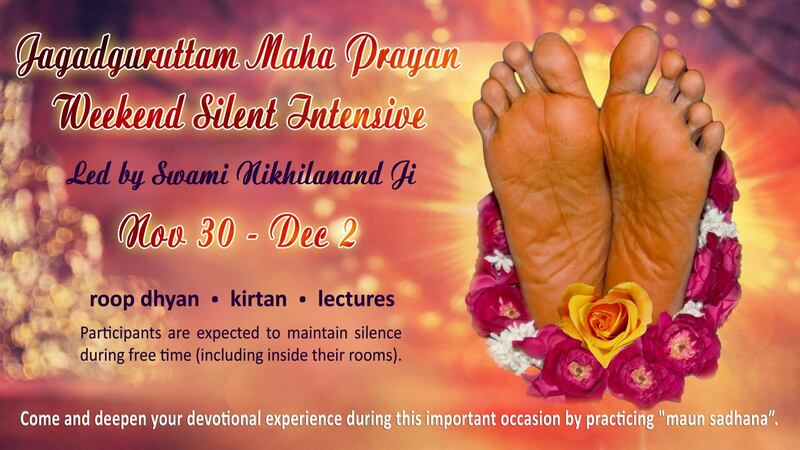 In remembrance of Shree Maharaj Ji, Radha Madhav Dham will be hosting a Maun Sadhana, or Silent Intensive, November 30-December 2. The intensive will be led by Swami Nikhilanand, and will include extended kirtan, lectures on the topic of Guru and Shree Maharaj Ji, special videos, silent walks, parikrama, and Guru poojan. We begin at 7:30 pm on Friday, November 30th, and conclude at 1:00 pm on Sunday, December 2nd. All ages are welcome to attend, but please keep in mind that all participants (including kids) are expected to maintain total silence during meal breaks, seva, and free time. This also applies when you are in the privacy of your own room. As a clarification, please note that during the devotional programming, there will be kirtan and lectures as usual; the “silent” part means that we don’t speak to each other during the breaks. This is an amazing opportunity to deepen your connection to Radha Krishna and Shree Maharaj Ji. I hope you can take advantage of it by joining us for this unique experience.